These products use the lateral side-surface of the sensor housing to sense the proximity of steel and iron mechanical parts and linkages. We can supply unique characteristics in or side-sensing proximity sensors, such as ZERO POWER-DRAIN during active sensing and TOTAL EMI/RFI IMMUNITY. Please note in the photo that the circular "sense here: labels mark the x-type sensing surface. 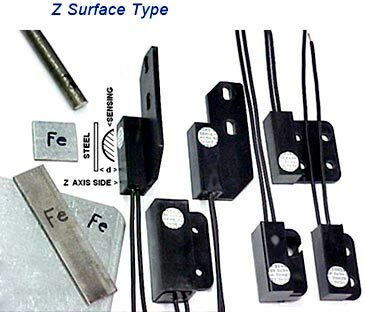 (See alternate page for x-surface and end-sensing surface types.) These sensors are based on either ultra-long life switching technology (usually 100+ million operations) or on magneto-electronic solid-state technology for virtually infinite life. This class of sensor is capable of small to very large sensing-gap distances from 1 mm up to even 25 mm (up to 1 inch), and also a range of current loads from logic-signals of 1 to 20 milli-Amperes, or (with simple modification) up to 200 milli-Amperes to power relay coil loads. Contact us to help select the best performance-value in the sensor internals for your particular use.